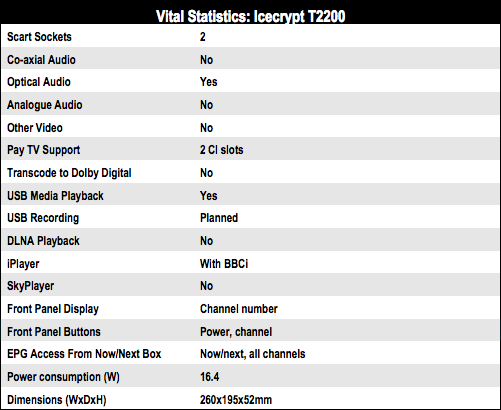 Review Built for Icecrypt by Topfield, the T2200 sports two CI bays into which modules for pay TV can be slotted, making it compatible with ESPN and potentially Sky Sports too. An additional flap on the front gives access to a USB port which supports media playback, including DivX, DivX HD, MKV and AVI/Xvid files. Icecrypt says an update with USB recording is in the works, and Dolby transcoding is being looked at - both are absent from the box for the moment. The flap over the USB port obstructs the channel change buttons, which may prove annoying when USB recording is added. But then most people will be using the decent remote control. 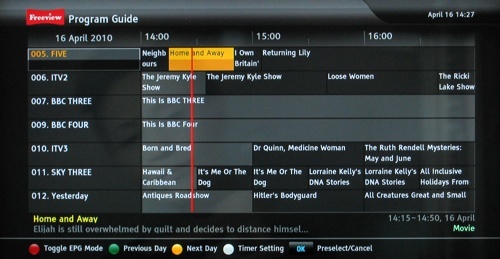 The T2200's EPG is clear, and there’s an alternative, newspaper-style layout, plus support for the creation of multiple favourite lists. But while the interface is straightforward and clear – not to mention quite familiar to Topfield users – it’s almost minimalist compared to some of the others, and lacks sparkle. 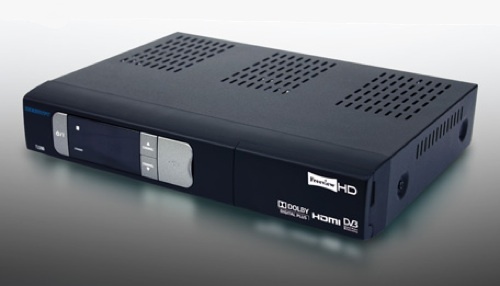 Two CI bays make this box a good choice for pay-to-view sports fans. That and good USB media playback help offset a dull interface. Analysis But what about cost?